Those bloomin’ green fly orchids! These little lovelies, the only tree orchids which grow in north Florida, are supposed to bloom in the early spring through summer. We have yet to record a month when these are not blooming on Womack Creek. We’ve seen increasing number of these orchids in other north Florida watery venues, so perhaps, something about the weather and growing conditions is encouraging their growth. These orchids seem to be able to withstand hard frost. But most live where water may moderate the temperature. Still, nowhere else, have we seen them bloom constantly. This entry was posted in Native Wildflowers, Tate's Hell State Forest, Womack Creek and tagged Native Wildflowers on December 9, 2018 by marylynanded. 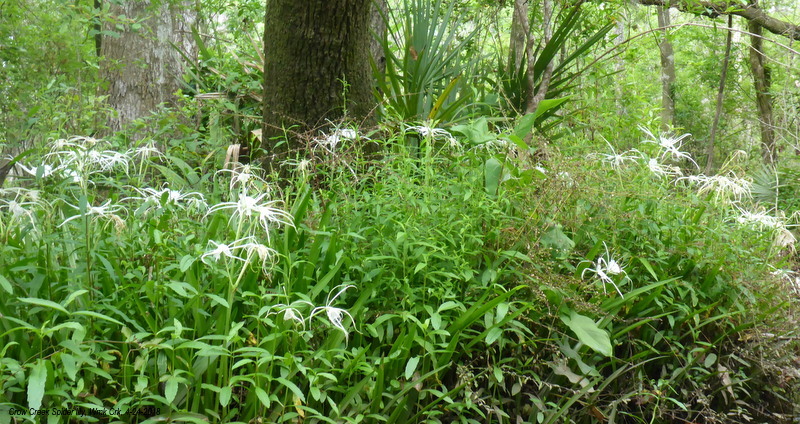 Cow creek spiderlily, an endemic species found only in Liberty, Franklin and Wakulla counties, Florida, is at peak bloom. Next week, it will be in seed. But continuing its bloom and its fragrance are swamp roses, throughout the creek. Little purple bells, hanging from vines throughout the creek, swamp leatherflower, Clematis crispa, are now in full bloom. Buds indicate that they will be blooming for several more weeks, at a minimum. Late spring, early summer colors are bolder: golden-yellows, blues and purples — narrow-leaf primrose, spatterdock, blue flag iris, pickerel weed. candy root. And, already in massed blooming, but greater density promised next week, false dragonhead blossoms. Soon also to be blooming in large masses, lizard tail. False indigo continues its long bloom period. Very early in the season, climbing aster are already blooming at the mouth of the river. 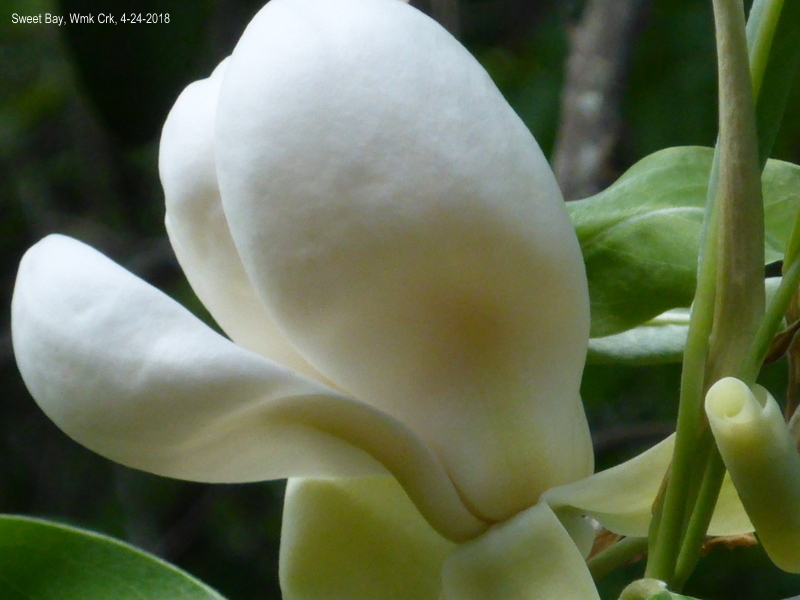 These flowers, in large masses throughout the river and also along Crooked River and upper Ochlockonee, will continue blooming till late fall. Green fly orchids, one of our favorite flowers, continue to bloom and new bud stems are appearing which promises flowering for another few more weeks. The next masses of white blossoms will be arrow head, heavily budded shrubs throughout the creek. 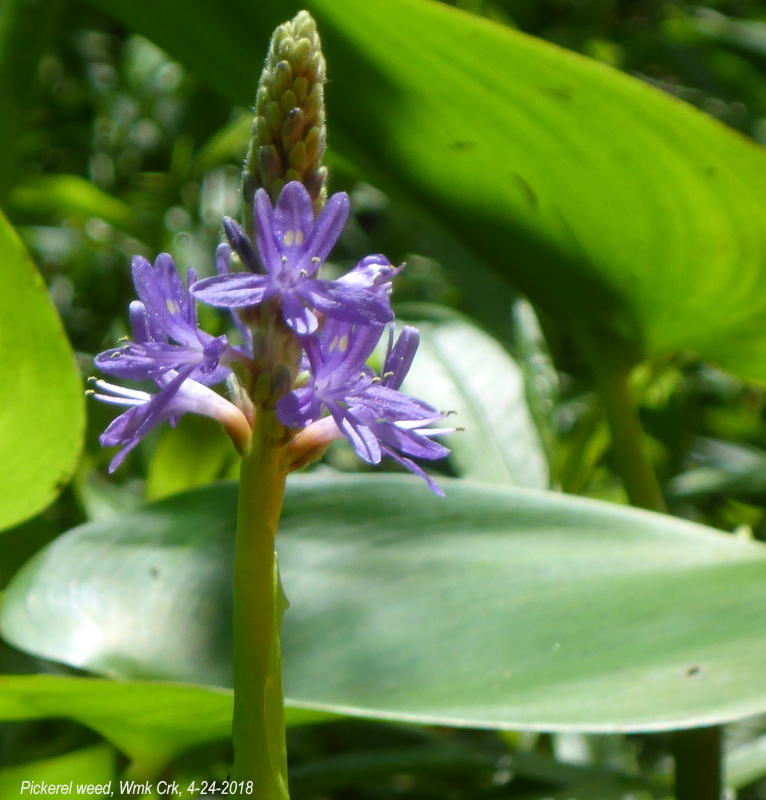 This entry was posted in Florida native wildflowers, Native Wildflowers, Tate's Hell State Forest, Womack Creek and tagged Native Wildflowers, Tate's Hell State Forest, Womack Creek on May 5, 2018 by marylynanded. 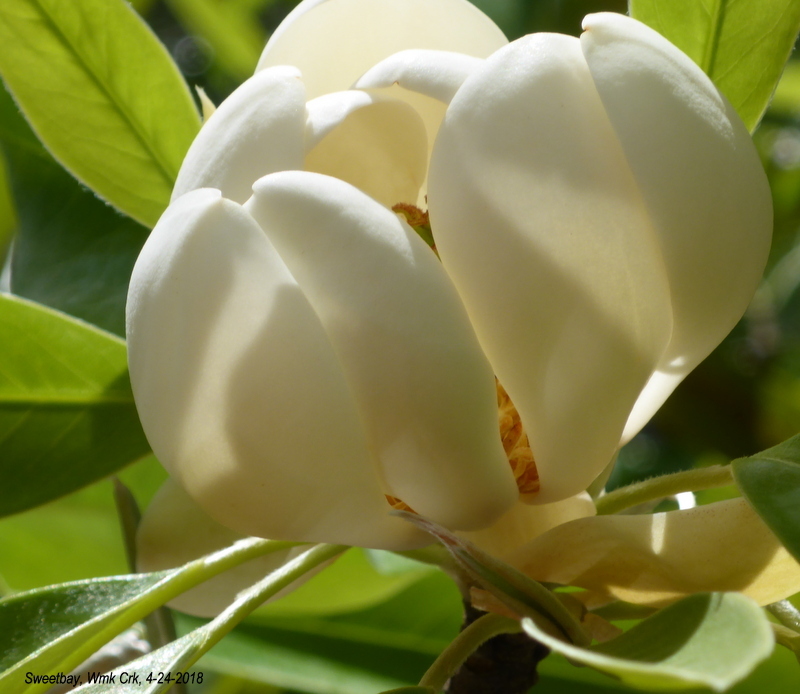 Within a week and for about a week after, expect the heavy scent of blooming sweet bay. 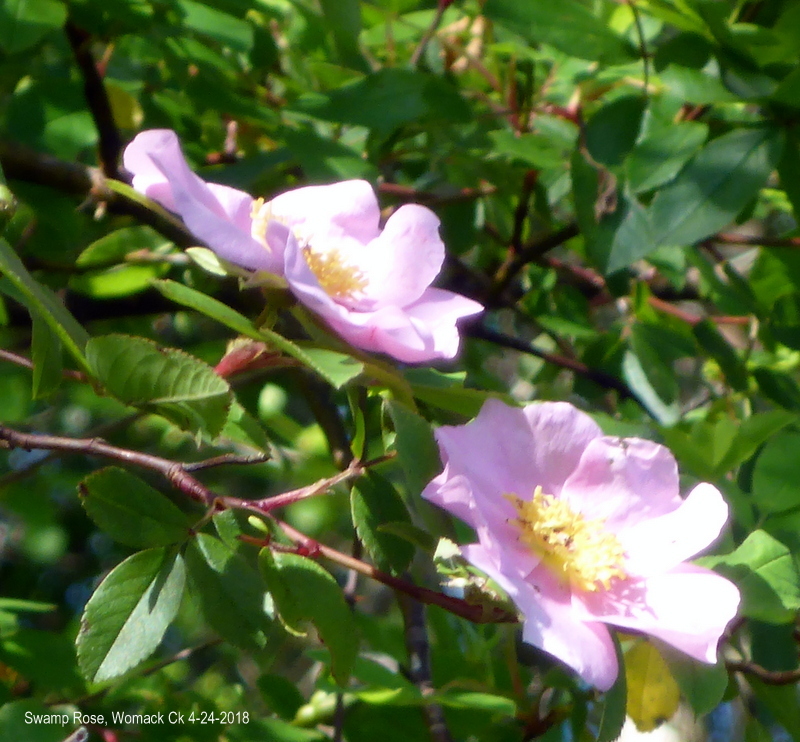 They will overpower the lighter, cinnamon scent of the swamp roses which are now blooming on bushes throughout the creek. Finally, the clematis crispa vines are bearing buds and flowers. 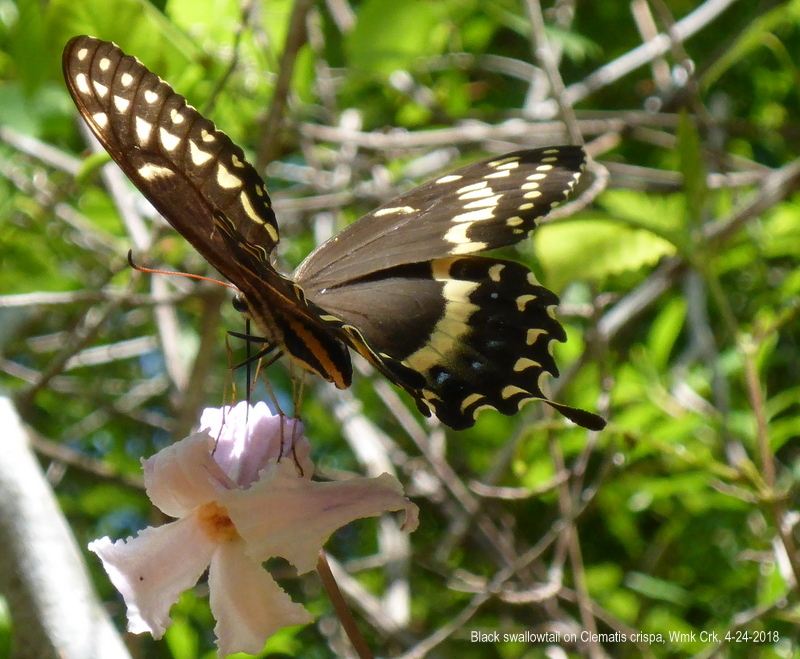 This black swallowtail butterfly was taking its fill of nectar from a bloom. 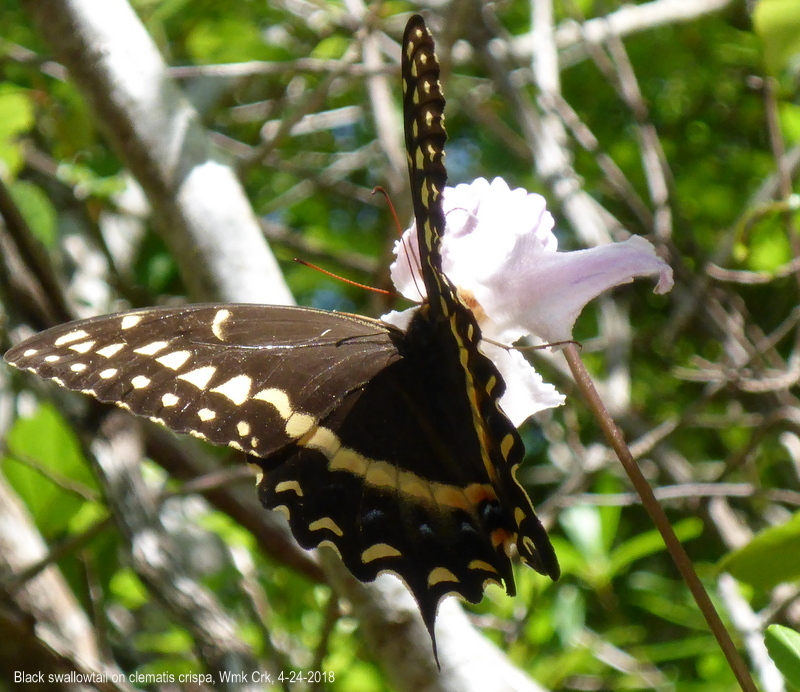 With the pinxster azaleas going to seed, the clematis blossoms may keep these butterflies on the creek. Blue flag iris and pickerel weed add bright blue color to the landscape, but they are usually in sunny pockets behind the shrubs and trees at water’s edge. 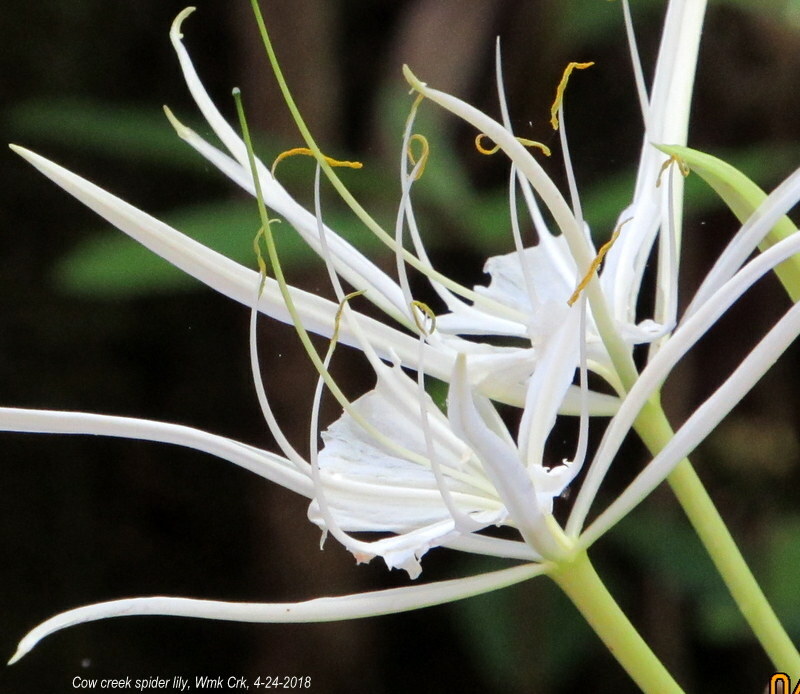 The cow creek spider lilies are blooming and should continue its bloom for about two weeks. 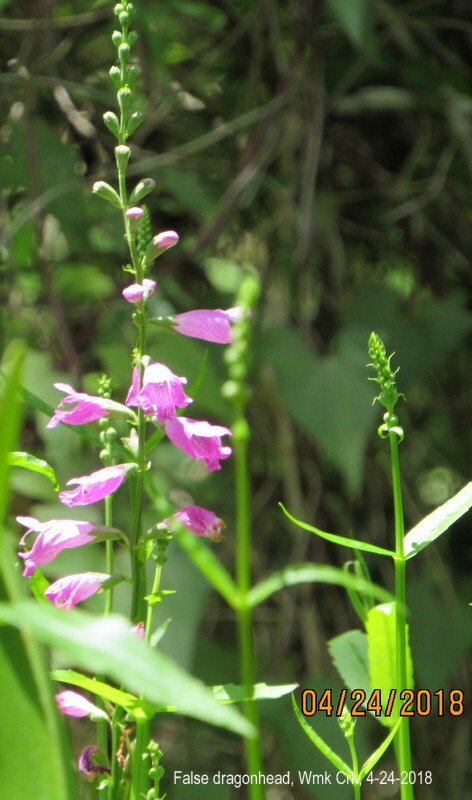 And within two weeks, masses of false dragonhead blossoms will be seen along the creek. 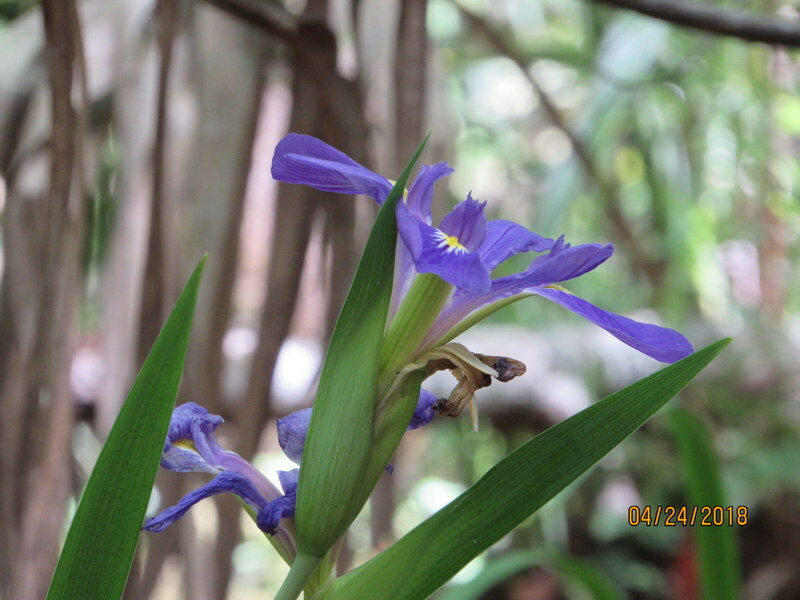 This entry was posted in Florida native wildflowers, Tate's Hell State Forest, Womack Creek and tagged Native Wildflowers, Tate's Hell State Forest, Womack Creek on April 24, 2018 by marylynanded.